The last work of famed modernist architect Oscar Niemeyer who died two weeks ago at age 104 might not be a building, but a line of shoes he designed for Converse. Niemeyer, best known for the visually-striking buildings of the Brazilian capital city of Brasilia, created a line of shoes that was released about six weeks before the architect&apos;s death — and went relatively unnoticed in the United States. The shoes feature words from a Niemeyer poem, written in Portuguese, in which he famously said his architecture was inspired by Brazil&apos;s mountains, bending rivers and curvy women. 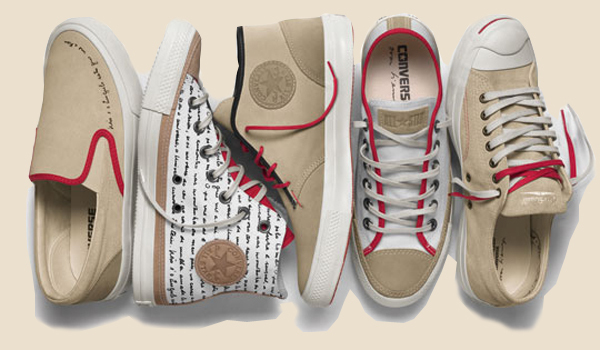 Converse released the line on October 23rd in celebration of its 104th year in business. In a news release, the company said the five new shoes were designed "with a nod to Niemeyer’s legendary curve and his creative, rebellious point of view." It might sound a bit like naked capitalism — like when Halston designed clothes for J.C. Penny — but it likely wasn&apos;t from Niemeyer&apos;s point of view, at least. The Brazilian-born architect, who was once president of the country&apos;s communist party, created his Converse chukka boot (third from the left in the above photo) as homage to an unbuilt anti-torture monument he designed in Rio de Janeiro. Other shoes in the line also carry political statements, according to Converse. 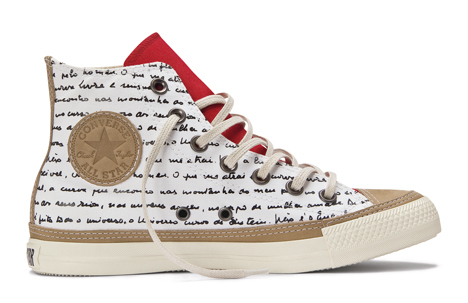 The Converse shoes are only available in Brazil — for now at least. They cost the equivalent of $85 to $135.